With the moon as its immediate goal, NASA is pushing hard on deep space exploration. In a press conference from Johnson Space Center (JSC) in Houston today (April 26), NASA officials talked through the status of their deep space exploration program and the upcoming launches of the agency's Orion spacecraft around the moon. A NASA report last year suggested the launch date could slip to June 2020. 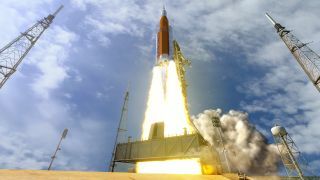 However, JSC Director Ellen Ochoa confirmed that NASA is still pushing to use the massive Space Launch System to send Orion around the moon for the first time, on the uncrewed Exploration Mission-1, by the end of 2019. EM-1, the spacecraft for that first test flight, is already being assembled at Kennedy Space Center in Florida, Ochoa said, and awaiting the European Service Module, which should arrive at the center this summer. (That module will sit below the Orion spacecraft, with the abort system attached above.) In the meantime, EM-2 — the spacecraft for the second Orion flight, and Orion's first crewed mission around the moon — is already being assembled at the Michoud Assembly Facility in Louisiana. It will make its way to Florida later in the summer. Before EM-1 — almost exactly a year from today, Ochoa said — NASA will test the spacecraft's abort system after a launch to a point more than 6 miles (9.7 kilometers) high in a short, but intensive test called Ascent Abort-2. "It's just a 3-minute test, but it will be an exciting 3 minutes," Ochoa said. Once Orion has reached the moon, NASA plans to spend a significant amount of time there honing systems and creating an orbiting outpost called the Deep Space Gateway, according to Vanessa Wyche, director of the Exploration Integration and Science Directorate at NASA. "Building on the transportation elements being developed today, the Space Launch System and Orion … and using the International Space Station as a platform to test technologies in LEO [low Earth orbit], we're working with commercial industry and our international partners to build and assemble a crew-tended spaceport in orbit around the moon in the 2020s," Wyche said at the conference. "NASA and its partners will use the Gateway for deep-space operations including missions on the moon with decreasing reliance on Earth. "We'll use the lunar orbit as a place to stage where we'll actually build up a small, crew-tended spaceport that will then do testing. We will learn about what's going on at the moon. We'll do testing on the moon's surface, and then we will build up, do other testing and move on to Mars," she added. "For a few years, we've been really planning to spend the decade of the 2020s in the lunar vicinity anyway, because we believe there's a lot we need to test and learn before we actually head to Mars," Ochoa added. "As we do spend time around the moon and on the moon, a lot of what we're thinking about is what it is that we need to accomplish there in order to move on to Mars after that." But before that, the teams will have to finalize Orion, get EM-1 launched and then launch EM-2, sending humans on a loop around the moon that will take them farther than people have ever traveled into space — 40,000 miles (64,000 km) past the moon. Near the end of the conference, NASA astronaut Nicole Stott shared some of her experiences working with the nitty-gritty testing that will make sure Orion and its procedures work. "Right now, we're doing a lot of the testing where I would be in a suit and with four crewmembers, we're strapped in to [a mock-up of] Orion," she said. "And we have a smoke machine, and they set off smoke, and they close the hatch. We're looking at, can we get out of this vehicle? How are we going to unstrap? How is the flow of us getting out?" Just last week, Stott said, they tested escaping from the docking hatch at the top of Orion in the event that the side hatch is inaccessible; a ladder came down that they had to climb up after throwing rafts out of the vehicle's top. "You can put all that in a very detailed plan, and the engineers do a great job of developing that … [but] human-in-the-loop testing and finding those things that you didn't think about because you have humans involved in this expedition is critical in the early development of this program," she said.